Green SoCal: Respect the Rails: National Train Day in L.A. Sometimes it seems train travel in the United States just can't get any respect. Many Americans go to far-off places like Shanghai or Paris and zip around on their modern, efficient high-speed rail trains. But when they arrive back in the U.S.A. they wouldn't consider riding on Amtrak and complain that the government gives our underfunded national inter-city passenger train operator too much money. "People complain about the subsidies for Amtrak or rail. But nobody complains about the subsidies for highways or airports -- both of which are dramatically subsidized by the government," said Rail Europe's regional sales director Jim Prchlik. "Rail is more efficient, it's cleaner and it provides for a better quality of life." 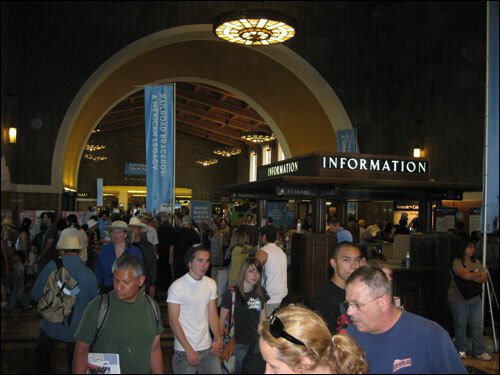 But at last Saturday's third annual National Train Day at Union Station in downtown Los Angeles (one of four major cities and 170 smaller communities hosting events), the large crowds including many families were a vivid reminder that people care about train travel in this country. The atmosphere at this year's event struck an optimistic tone about the future of rail in this country after 60 years of shameful neglect. Amtrak spokesperson Vernae Graham told Green SoCal that they are trying to change "the mentality of people so they get out of their cars here, especially in Southern California. They will get out of their cars if they know that the train is reliable and it's convenient. Once people get on the train and have a good experience and get to their destination on time, then they become regular passengers." Graham added that events like National Train Day try to educate and "expose them to what others around the world have known for decades." And in Europe and Asia since the 1980s they have known the many advantages of traveling by high-speed rail, while in America we've been chugging up a slow hill in train cars from the 1940s and tracks from the 1840s (both true, look it up) while more modern but also more polluting cars and airplanes have been the preferred mode of travel. But now that the Obama administration has demonstrated their firm commitment to updating our rail infrastructure for the 21st century, there is a renewed commitment to level the transportation playing field. California is at the forefront of the high-speed rail revolution and was the largest beneficiary of the $8 billion in high-speed rail funding that was included in the American Recovery and Reinvestment Act of 2009. The California High-Speed Rail Authority was at the event getting wide-eyed old men and little tykes alike excited about the high-speed rail future with a multimedia video and mouth-watering facts. For example the 800-mile system will travel at speeds of 110 miles-per-hour in urban areas and 220 mph in the Central Valley. That means a train trip from Los Angeles to San Francisco will take two-and-a-half hours and the ticket will only cost 70% of the going airfare rate. But until the dedicated high-speed rail corridors are built, improving upon conventional train travel is something Amtrak is working on with increased funding for the first time in a long time. Also, groups such as the Coast Starlight Communities Network (long-distance train from L.A. to Seattle) are advocating for improvements to rail service that can have immediate benefits. "We've been at Union Station for each of the Train Days that have happened so far. It's a great way to get people that are interested in trains who want to know how to become involved in trains in a productive way," said Coast Starlight representative Justin Walker, who was also repping the advocacy orgs Train Riders Association of California and The Transit Coalition. "It's good for people to like trains, but it's even better for them to know how to be active to get more trains and more useful trains"
From the environmental perspective, train travel is a cleaner, greener mode of travel than gas-sucking, carbon-spewing cars and planes. One organization, Santa Barbara Car Free, was there promoting an incentives program where Angelenos can take the Pacific Surfliner train from Union Station to Santa Barbara and walk, bike and take public transit in the city. And train riders are rewarded with 20% discounts at over 40 partner businesses. Santa Barbara Car Free representative Mary Byrd explained that "the whole idea is to leave your car and take the train to Santa Barbara for cleaner air and a healthier planet."